In November 2008, I wrote my stratigraphy stylesheet, which contained colour codes for all units from the International Stratigraphic Chart (ISC) down to the period/system level. Later I added some Cenozoic and Mesozoic units of lower rank. When I was ill during the last weekend and therefore sometimes rather bored, I completed the colour codes. I have added the new colours to the original stylesheet file. 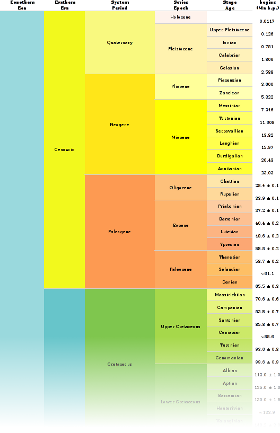 As an example, I have prepared (or more honestly, made my computer do it) a HTML version of the International Stratigraphic Chart 2009. Some gory details about how to get hold of stratigraphic colour codes below the fold. For my first version, I referred to two sources for the colour codes: a table by the Commission for the Geological Map of the World (CGMW) and the stratigraphic chart with colour codes by the International Commission on Stratigraphy (ICS). The ICS's International Stratigraphic Chart, which can – at least at this moment1 – found here on their site, contains a note that the colours are according to the CGMW. However, as I noted in my post back then, they do differ in some places. I stuck to the ICS colours and recorded those from the “original” CGMW table as variants (down to the period/system level). In the meantime, both original sources have disappeared. It would have been nice if the commissions at least left a note about why they are no longer available. It doesn't seem like the colour codes were obsolete, as there are no new versions. The CGMW had a link to their colour table close to the bottom of the page “Catalog”. Thanks to the Wayback Machine, I could download the table from the last archived version (27.10.2007) of the site. Here's the local copy: couleurccgm.pdf. Luckily, the website of the Subcommission for Stratigraphic Information (at Purdue University) still has a copy of both the RGB and CMYK charts. Back in January, I compared some RGB codes to my stylesheet and my old hardcopy, and I'm quite sure they're the same. (Despite the heading “according to the CGMW”, they are those I used primarily, and different from the variant I labelled “CGMW”.). New files have appear in the meantime, dated October 2010. That's interesting! I just tried it myself, and indeed, it offers to translate from Indonesian. However, the translate.google.com site guesses correctly. « It is pitch black.